Blockbuster Video still has stores. Really. Sure, the company itself is bankrupt, but they allowed a few franchises to keep the name. These few remaining stores stand as the ruins of an empire that once had 9000 stores and employed 60,000 people. You may recall the companies attempts to start an on-demand online service (which is still around) or its attempt to compete with Netflix Dvd home delivery. Less likely, you may remember the company’s attempt to diversify with more snacks, movie posters, and merchandise. What you certainly remember, is that none of these things worked, and how fast they failed. Walk into any Barnes & Noble and you may have your memory jogged. You may also be forgiven for thinking you just walked into a toystore. Puzzles, games, and other late attempts at product diversification abound, and diversification, while great in your stock portfolio, may signal trouble. In fact, it can be assign of desperation, a sign the end is near, as it was with Blockbuster. You can judge how bad things are by the distance between what is called the “Core competency” of the company, in this case books, and the new product. Ask yourself this: is there any reason why Barnes and Noble should be particularly well suited to selling action figures and Lego’s? Don;t worry, we’ll get to their comic ineptitude with the Nook later, but Settlers of Catan is not something I want to ask a store employee about in Barnes & Noble, when they had someone to ask. In truth, t was the books themselves that carried product diversification, and those had to go to make room for these new products which B&N does not know, and is not expected to know, how to sell. Borders (remember them?) also died at its own hand, selling its online book-selling service to some go-nowhere startup called Amazon for the tidy sum of $20 million. It would be easy to draw comparisons and claim these problems are industry wide. One can’t download a cat picture these days without running into an article about the ailing publishing industry. 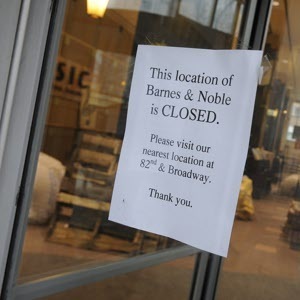 The problem for Brick and Mortar stores, however, is that the publishing industry is doing fine. The Association of American Publishers reports book sales are up, particularly in the YA category. A year ago, the mega-bookseller shuttered their 5th ave location, drawing the curtain on any attempt at college students in the area. Astor place and Lincoln center locations have long since the way of the Dodo. The Bronx location, the only general interest bookstore in the area, has recently signed another two year lease, but still, ticktock. 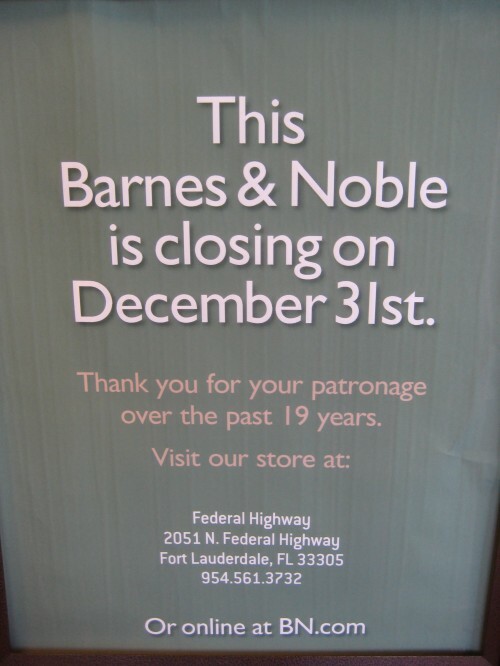 While the soon to be unemployed management at B&N will no doubt claim that the company’s decline was the result of market forces beyond anyone’s control, several points of malpractice are obvious. At the heart of every Barnes & Noble lies a vast wasteland where the damned live out their Sisyphean curse of trying to sell the Nook. These areas have a certain haunted feel to them, with the bright lights, large screens cycling video, and negative space; it’s not unlike a sci-fi film about the near future where something has gone wrong and wiped the earth clean of its population. You half-expect a tiny robot to roll by, tumbleweed like, carrying out its minor duties to a population long dead. What is disturbing is that at some time, someone had to make this very pitch to the board of Barnes & Noble, and everyone agreed to greenlight the idea. As of February of 2014, everyone at the company associated with the Nooks creation was fired, so at least there’s some progress. Imagine if the Bookseller had acted according to even the most basic tenets of good business practice and sought out partners first. Imagine if, when Apple was still developing its own bookselling eco-system, Barnes & Noble had approved them, publishing contracts in hand, and made a deal to put the Barns & Noble app native on Apple mobile devices. 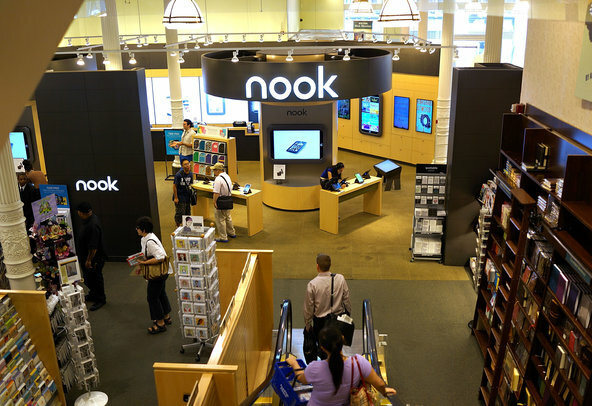 Imagine if every Nook nook was a tiny Apple store, and the lines you normally see around the corner were instead wrapped around the isles of a well stocked bookstore. Amazons great strength; its automation, comes at a price. Its algorithm may be able to make clever recommendations based on the shopping habits of others, the rare joy of discovering what you didn’t realize you were looking for remained in the hands of the brick and mortor store. B&N could have capitalized on this by having actual people with actual recommendation in their store. Instead, what precious little staff is left is reduced to sadly hawking Nooks. Even a layman can see that the smaller the store, the greater the imperative for hands on customer service. The Books-a-million model is clearly trumped by the online books-a-billion presence of online outlets. The Boutique model is better. Amazon has a good algorithm for prediction what you might like to read based on your browsing and purchasing habits; good but not perfect. Human beings are still better, and still cheap. Why is the primary means of interacting with customers still a rogues gallery of staff recommendations perched near the front? Once again, the physicality of the place, that it IS a place, was a trump card left unplayed. Author signings are good, but they don’t happen enough to move books. Book clubs are more comfortable elsewhere. It has been a longstanding policy of the company to hire community managers to engage the community, but they not been given the tools they need to keep up with changing customer needs. By March of next year, the disastrous Nook adventure will come to an end as the division is spun off into its own doomed company. Microsoft, also known for its incompetency, had invested 300 million just two years ago. Now they, rat like, are jumping ship. This has resulted in a momentary pause in the bleeding. There are some promising signs, such as teaming up with Google in LA and New York to attempt say day delivery and adding print-on-demand services in store for rare titles. These small steps, reminiscent of Blockbuster’s flailing attempt at home delivery, are death throes. To go up against Amazon now in the home delivery service is yet another departure from their core competency and venture into a highly competitive environment in which they few unique advantages. The company continues to shrink every year, and they project “single digit” loses in fiscal year 2015 as well. Why wouldn’t they? What would stop the trend save bankruptcy? The ailing retailer still has occasional stock spikes, primary the result of big fish looking for a bargain and threatening a takeover, but the company loses four to five percent of its sales a year. They did last year, they did this year, and the project they will next year. Perhaps the greatest asset the company possesses is the abundance of good will surrounding the sole remaining national book store chain. 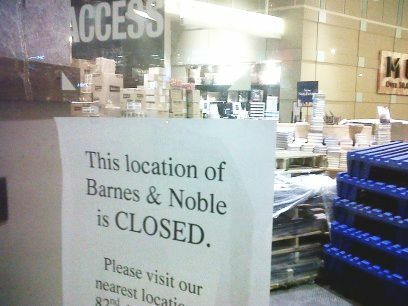 No one wants Barnes & Nobel to fail. Goodwill, or consumer surplus, may not be enough. If the venerable bookseller can’t grow even as book sales grow, and in a surging economy boasting high retail sales, when will they?